Hominids are humans (Animalia, Chordata, Vertebrata, Mammalia, Primates, Hominidae). Fossils of the human family are known back to the Miocene. Many species are known in Pliocene and Pleistocene sedimentary rocks. Only one species in Family Hominidae is alive today, in the late Holocene - that's us, Homo sapiens. 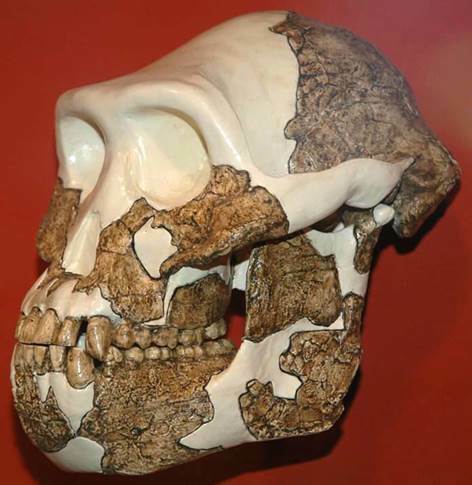 Hominids originated in Africa - that's where the oldest human fossils occur. Everyone on Earth is African, from an evolutionary point-of-view. Shown below are replicas of some of the better known hominid fossils. 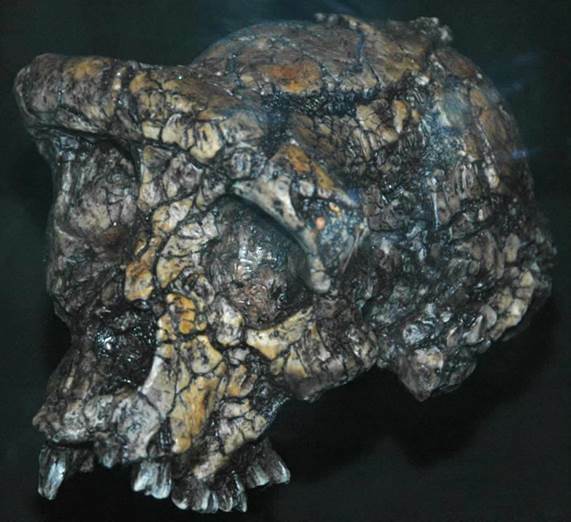 Sahelanthropus tchadensis (replica) - 6 to 7 million year old skull from the upper Upper Miocene of Chad in north-central Africa. It has characteristics of both apes and hominids. It is considered by some researchers to be the oldest known member of Family Hominidae. Others classify it as an early ancestor to modern African apes (Family Pongidae). 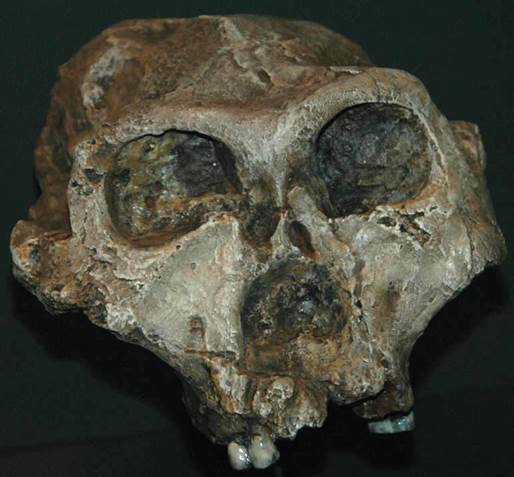 Sahelanthropus tchadensis has a prominent, continuous, slightly curving brow ridge above the eyes, a small braincase, and relatively small canine teeth. Locality: Toros-Menalla Quarry, western Djurab Desert, northern Chad, north-central Africa. Kenyanthropus platyops (above & below) (replica) - 3.3 to 3.5 million year old skul from the Upper Pliocene of the Lake Turkana area, northern Kenya, eastern Africa. 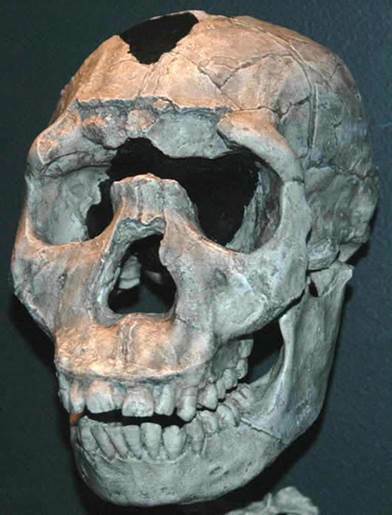 This hominid has a relatively wide, slightly concave, prognathic face, a moderately small brain, and teeth having transitional morphologies between apes and modern humans. 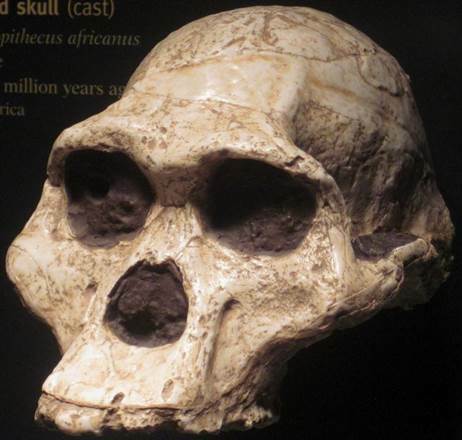 Paleoanthropologists disagree on its classification - some classify it as Kenyanthropus platyops, others call it Australopithecus playtops, and others consider it a variety of Australopithecus afarensis. Australopithecus afarensis (above & below) (replicas) - this species existed from about 2.9 to 3.9 million years ago, during the Pliocene in eastern Africa. The discovery specimen was a skeleton nicknamed "Lucy" (or sometimes "Larry"). Multiple skeletons have been found together. 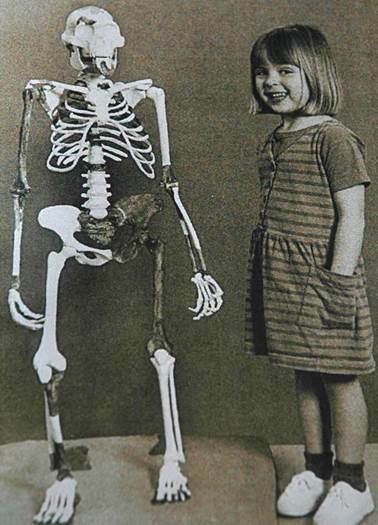 The adult height was about the same as a modern 6-year old child (see below). 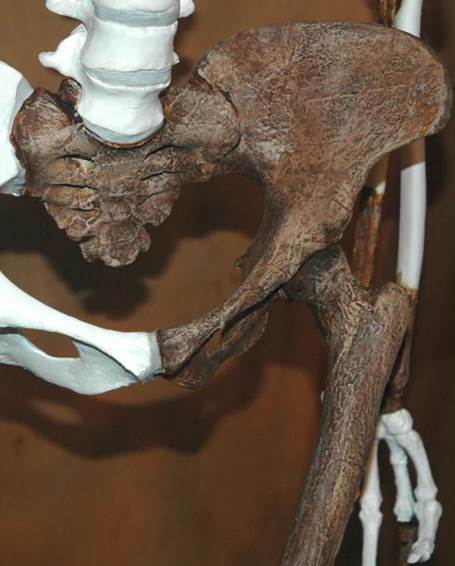 The femur and hip bones (see below), foot and toe bones of various specimens of Australopithecus afarensis show that this was an upright, obligate biped - it was an early human walking on two legs. 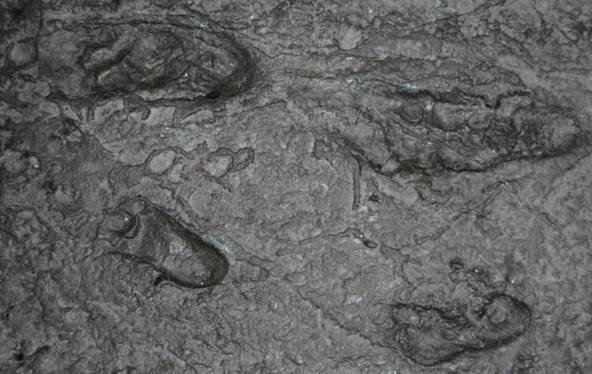 Trace fossils also indicate this - footprints of an obligate biped that is probably Australopithecus afarensis occur in a ~3 million year old volcanic tuff in Tanzania, eastern Africa (see below). Skulls of this species have a brow ridge, a prognathic face (= projecting jaw), and teeth intermediate in morphology between apes and modern humans. Compared with modern humans, Australopithecus afarensis had smaller bodies, relatively smaller brains, and large molar teeth. It was probably sexually dimorphic. 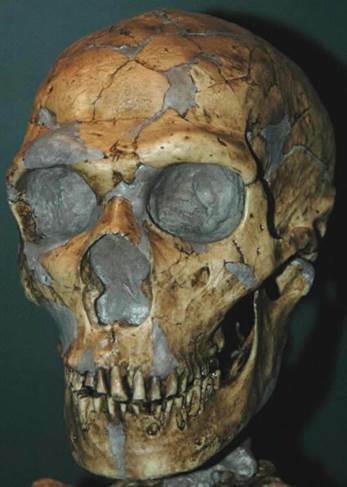 This hominid generally lived in forests and was likely a frugivore (fruit eater) and leaf eater. Australopithecus africanus (above & below) (replicas) - this species existed from about 2.04 to 3.03 million years ago, during the Late Pliocene in South Africa. 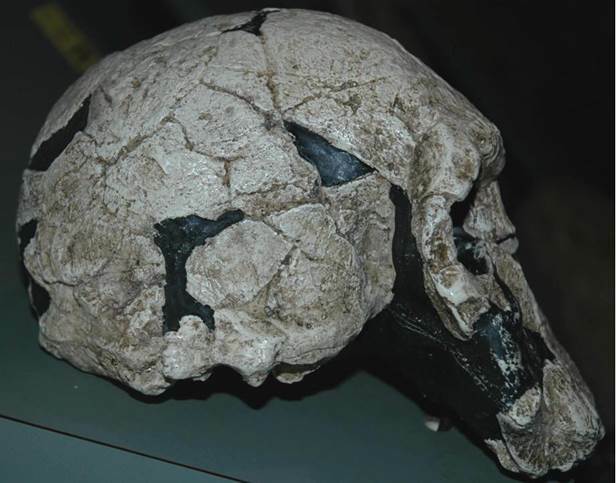 The discovery specimen is a child's skull and brain endocast (see above left) - this is the Taung Skull. The skull shown at above left and below is an adult. The position of the foramen magnum at the bottom of the skull indicates that this organism was an upright biped. Hundreds of fossils of this species are now known from South Africa. Like its ancestral species, Australopithecus afarensis (see above), Australopithecus africanus was probably a fruit and leaf eater. Paranthropus humans were the oddest members of Family Hominidae. Three species are known (see below) - they are characterized by having a bony sagittal crest at the top of the skull, a concave upper face and projecting jaw, wide and massive cheek bones, large chewing muscles, and relatively large molar teeth. These hominids had significant sexual dimorphism. They were specialized herbivores, feeding principally on grasses, which is a low nutrient-content food source. Some Paranthropus controlled fire. They were apparently tool makers and tool users. 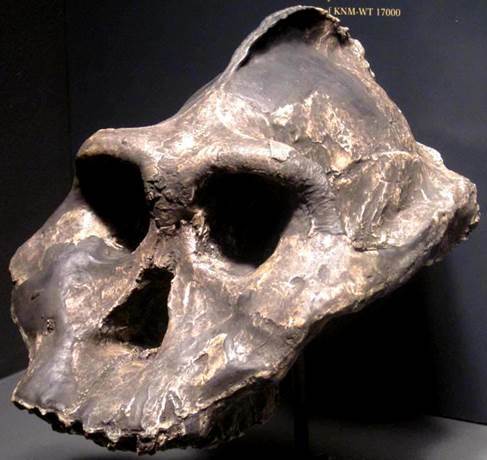 Paranthropus aethiopicus (replica) - skull from the Pliocene at Lomekwi, western Lake Turkana area (= western Lake Rudolf area), northern Kenya, eastern Africa. This specimen is nicknamed the "Black Skull". 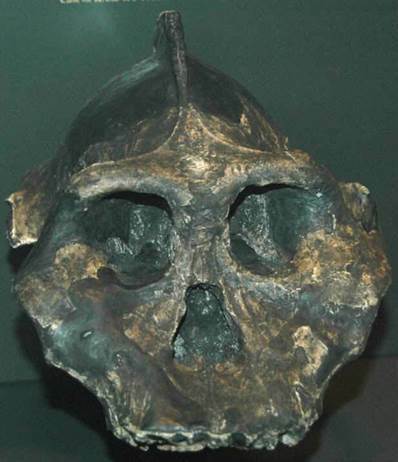 This species has a strongly projecting, prognathic face and a tall sagittal crest atop the skull. 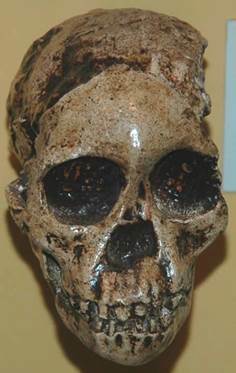 Paranthropus boisei (replica) - skull from the Pleistocene of Tanzania, eastern Africa. 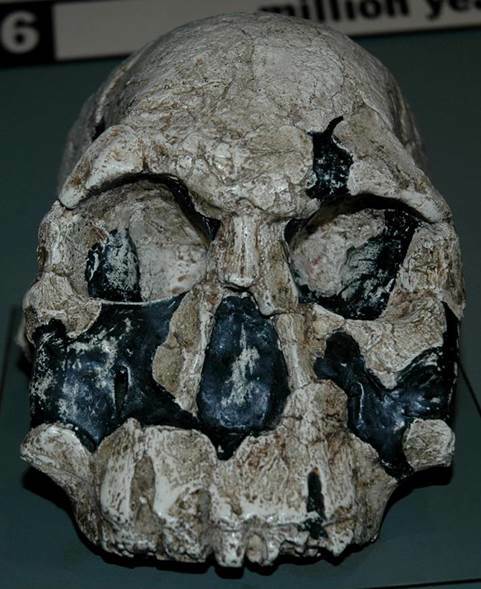 Paranthropus robustus (replica) - skull from the ~lowermost Pleistocene at Swartkrans, South Africa. 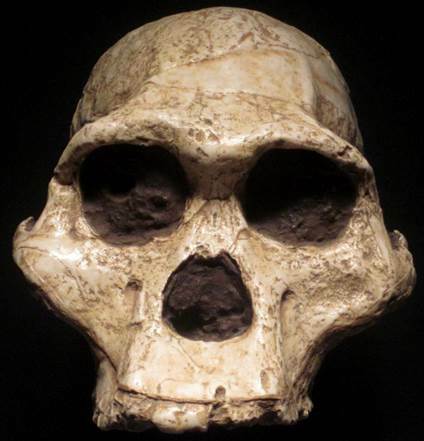 Homo humans evolved from Australopithecus in the Late Pliocene, at ~2.5 million years ago. Many species names are available for fossils of Homo hominids, but disagreement exists over the validity of some taxa. 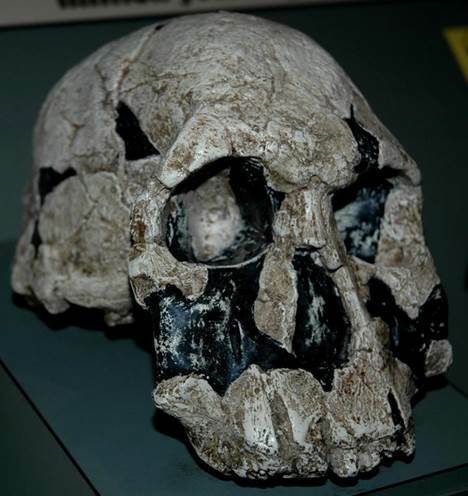 Representative skulls of various Homo species are shown below. Homo rudolfensis (Alexeev, 1986) is a late Pliocene hominid from eastern Africa, representing an early member of the genus Homo. The best specimen is the holotype KNM-ER 1470, a cranium housed at the Kenya National Museum (Eastern Lake Rudolf collection). The original fossil was fragmented into hundreds of pieces, but most of the braincase and face was determined to be present. 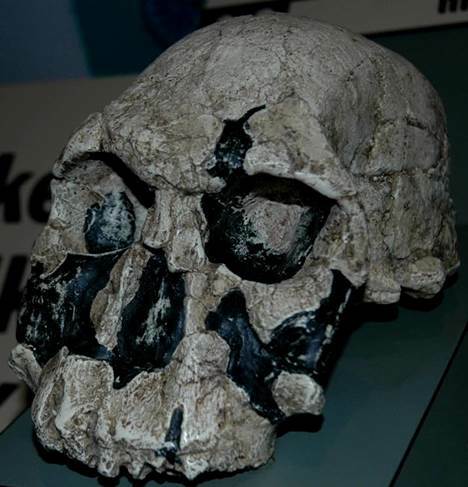 The skull was found in the early 1970s at Koobi Fora, in the badlands east of Lake Rudolf (a.k.a. Lake Turkana), northern Kenya, East African Rift Valley. It comes from just below the KBS Tuff in the Koobi Fora Formation (Upper Pliocene), and dates to ~1.9 Ma (early published dates of 2.6 Ma for the KBS Tuff were controversial; careful 40Ar-39Ar dating by McDougall (1981) has conclusively shown that the ash bed is 1.88 million years old). 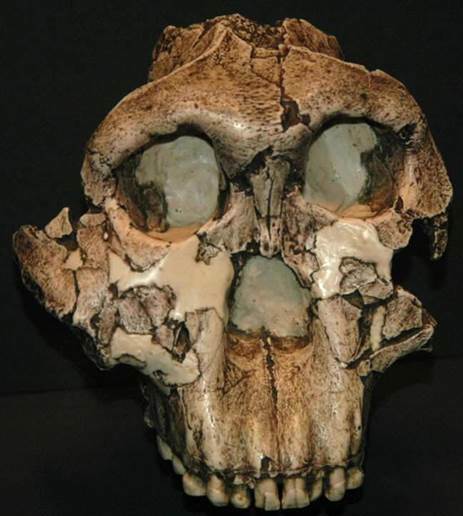 This makes Homo rudolfensis a contemporary of Homo habilis. 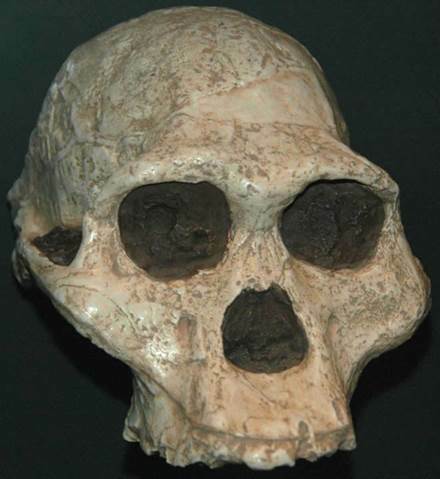 Fossils assigned to Homo rudolfensis indicate its age range is about 2.4 to 1.6 million years ago. 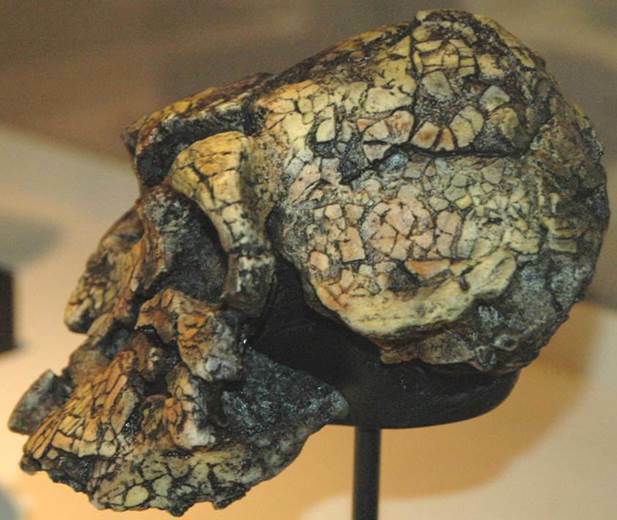 The key, distinguishing characteristics of the Homo rudolfensis skull are a large braincase and a relatively flat face. The braincase volume was originally estimated to be ~800 mL, later downgraded to ~750 mL, and more recently estimated at ~525 mL. A recent revised reconstruction indicates that the face is noticeably prognathic. Homo rudolfensis (Alexeev, 1986) (above & below) - replica of KNM-ER 1470, the holotype cranium of the late Pliocene hominid Homo rudolfensis (replica on display at the Cleveland Museum of Natural History, Cleveland, Ohio, USA). The dark-colored areas represent portions of the skull that were not recovered. 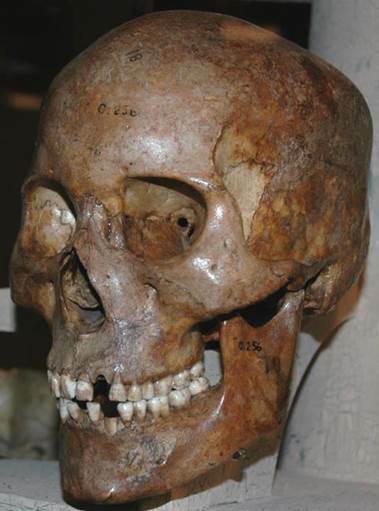 These photos show the traditional reconstruction of the skull. The exact nature of the contact area between the braincase and the face has always been somewhat uncertain. A 2007 revised reconstruction has the face of this creature projecting forward more than shown here. 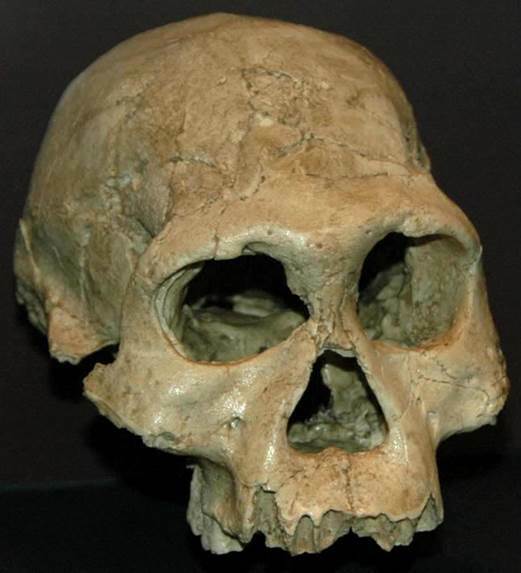 4) rudolfensis is an early Homo species. Most info. from Tattersall & Schwartz (2000) - Extinct Humans. Some info. from McDougall (1981) - Nature 294. 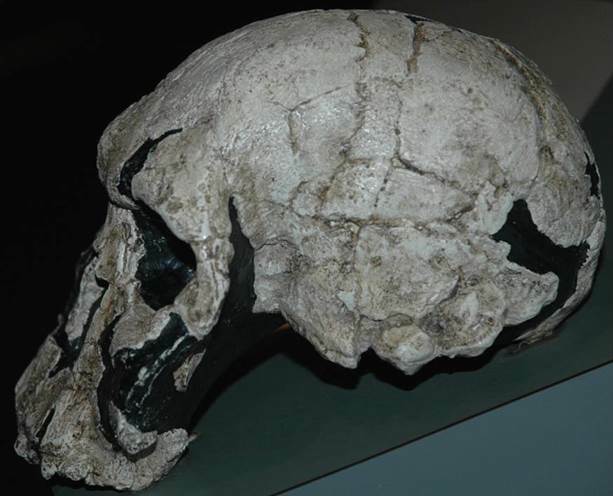 Homo georgicus (above & below) (replica) - skull from the near-lowermost Pleistocene of Dmanisi, Georgia, western Asia. 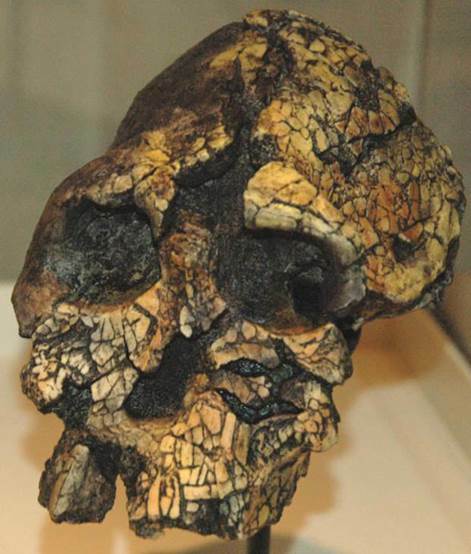 This 1.77 million year old skull is the oldest known hominid found outside of Africa. Some researchers classify this specimen as a distinct species, while others call it an African population of Homo erectus, and give it a subspecies rank - Homo erectus georgicus. Homo ergaster (above & below) (replica) - skull and skeleton of a teenage boy from the Lower Pleistocene at Nariokotome, western Lake Turkana area, northern Kenya, eastern Africa. Some researchers classify this specimen as an African population of Homo erectus. 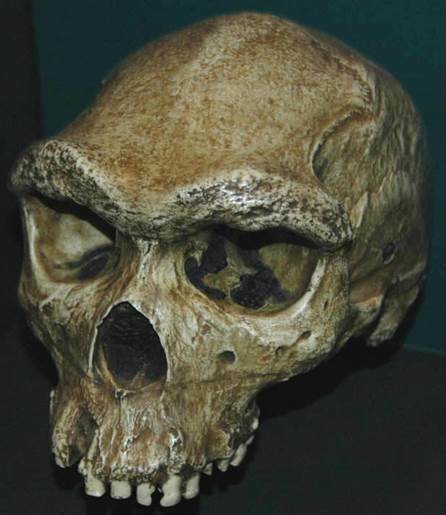 Homo heidelbergensis (replica) - skull from the Pleistocene at Kabwe, Zambia, Africa. Homo neanderthalensis (above & below) (replica) - skull and skeleton from the Pleistocene of Europe. 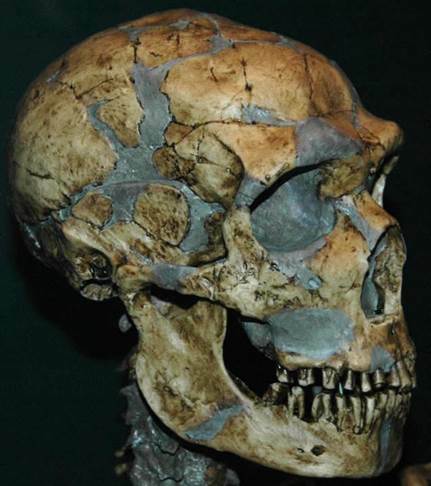 Compared to modern humans (Homo sapiens), neanderthals have larger braincases, no chin, a distinctive brow ridge above the eyes, a slightly convex face, and an occipital bun at the back of the skull. 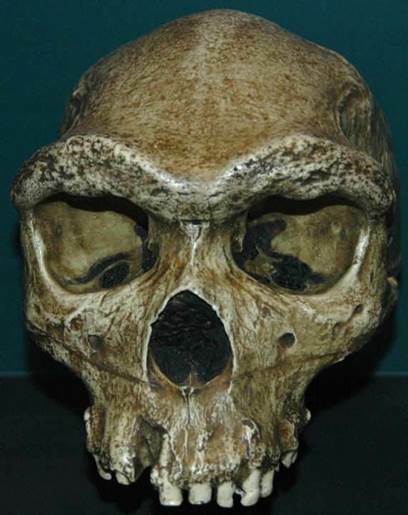 Homo sapiens - real skull of a modern human. 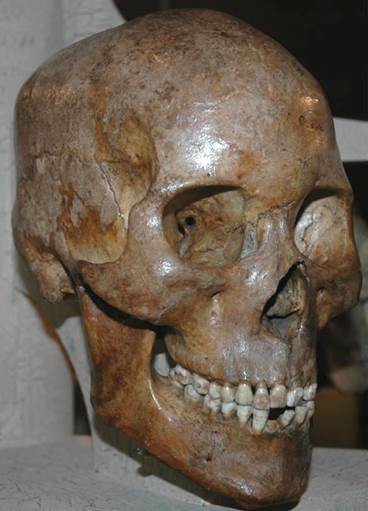 Compared with neanderthals (see above), modern humans are characterized by the presence of a chin, an absent to subtle brow ridge, a smaller braincase, and a flatter, ~vertically-oriented face.